Students were introduced to different aspects of legal education last week for Discover Law Day at the University of Houston Law Center. 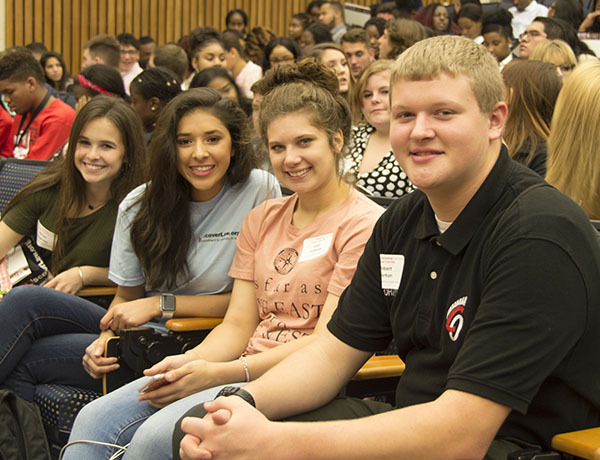 Nov. 21, 2017 — High school and college students from Houston and the surrounding area visited the University of Houston Law Center Friday for Discover Law Day 2017. Associate Dean for Student Affairs Sondra Tennessee welcomed the students and shared her four Ps to success – plan, prioritize, publicize, and persist. "The type of job you really want to think about is what you're good at, what you like to do and what somebody will pay you to do," Tennessee said. "I don't care how extreme your situation is, and it might not always be easy, but with a plan, with priorities, with publicizing and persisting, if you keep on you will achieve your goals." Assistant Dean for Admissions Pilar Mensah introduced students to the benefits of DiscoverLaw.org, a website hosted by the Law School Admission Council that encourages racially and ethnically diverse students to discover career opportunities in law and choose a path in undergraduate school to help them succeed. An alumni panel discussed the versatility of a law degree and featured Monica Mensah '14, director of student advisement at the Law Center, Abby Kotun '13, an associate at Haynes and Boone, LLP, immigration attorney Luis Ruiz '14 and Alissa Gipson '16, an associate at Chamberlain Hrdlicka. Students also heard from Tiffany Tucker, assistant dean for Career Development, who stressed the significance of maintaining professionalism. Tucker encouraged students to display civility in email and other online communications as well as during telephone calls and on-campus visits. "You want to start thinking about professionalism now so that you can own your brand," Tucker said. "You want to represent yourself in a way that you know the message is being received. In email communications, you want to make sure that when you're talking to an admissions department that you don't speak to them like you would speak to your friends. Always include a salutation and your email and you want to use an email signature which helps the receiver of your email understand who they're talking to." Students also participated in a mock Constitutional Law class taught by Professor Ron Turner and a question and answer session with current students. The high school students came from Atascocita High School, Carl Wunsche Sr. High School, Coldspring-Oakhurst High School, Elsik High School, Harmony School of Discovery, Memorial High School, Northbrook High School, The Pro-Vision Academy, Ridge Point High School, Spring Woods High School, Stratford High School, and YES Prep High School. Discover Law Day concluded with current college students learning about law school admission and the Law Center's Pre-Law Pipeline Program. Undergraduate students are encouraged to explore the Pipeline Program, which recently completed its third year. The program was established by Law Center Dean Leonard M. Baynes and Program Manager Kristen Guiseppi. The eight-week summer course is designed to increase diversity among law school applicants and to provide students from underrepresented backgrounds an opportunity to seriously consider law school. College students came from Houston Community College, the University of Houston, the University of Houston-Downtown, Prairie View A&M University and Texas Southern University. 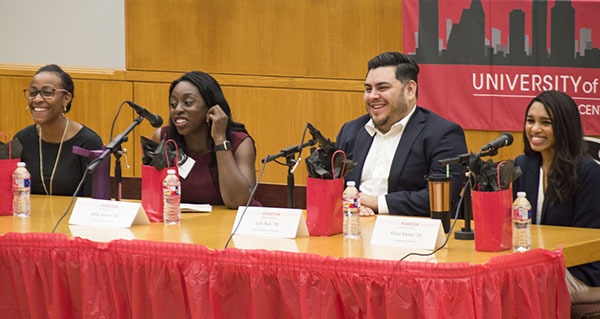 An alumni panel, including Monica Mensah, left, Abby Kotun, Luis Ruiz and Alissa Gipson, discussed the versatility of a law degree.